Dubai is full of glitz and glamour and is well-known for being a playground for celebrities and multi-millionaires the world over. 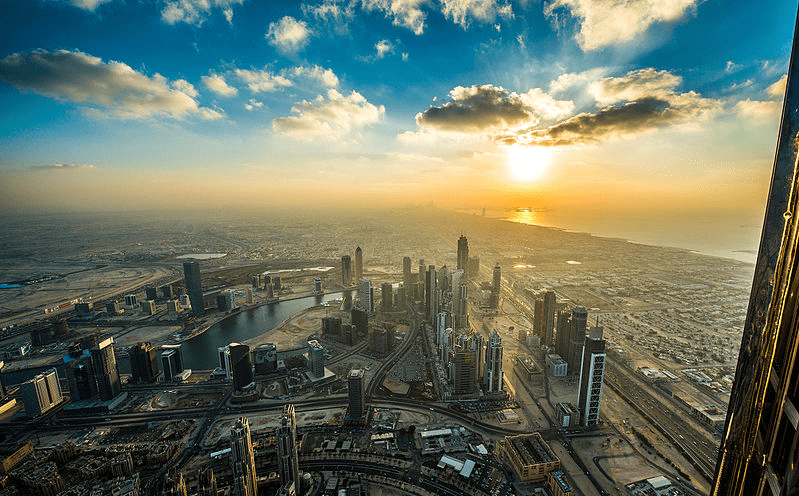 Dubai is also full of amazing attractions and sights to see, and with this in mind I have compiled a list of some of the best spots to take a photograph in the United Arab Emirates city. The Top of the Rock (the Rockefeller Centre in New York City) might be regarded as boasting the best views over a city, but the Burj Khalifa undoubtedly offers the best views over a city anywhere in the world. Holidaymakers who have bought their tickets for flights to Dubai and are planning their itinerary before their break in Dubai should have a visit to the Burj Khalifa right at the top of their list. The Burj Khalifa is the tallest building in the world and has a staggering 160 storeys, but once you take the elevator up to the world’s highest observation deck at Level 148, you can enjoy breathtaking views of the city below. You can get some great shots of the city and surrounding area from the observation deck, so make sure you take your tripod if you have one. If you decide not to scale up the world’s tallest building, then instead take some snaps looking up and try to capture the magnitude of this iconic building within your photograph. If you like taking photos of skyscrapers then the Dubai Marina is the place to visit as it is surrounded by tall buildings. To take the best photographs it is best to head to the marina either at night or in the early morning as you will hardly see a soul and can take some majestic photographs of the surrounding skyscrapers. Business Bay is one of the most popular spots for photographers to visit in Dubai as the arc of the bridge with the Burj Khalifa and the rest of the cityscape in the background is good enough to go on the front of a postcard. There is still a lot of construction going on around Business Bay, so try to choose a spot that avoids the work that is going on. With all the modern-day skyscrapers it is quite refreshing to visit the fish, fruit and vegetable markets in Deira to take some vivid, lively photos. The variety of vibrant colours make great shots, as does capturing the traders at work, as it shows a different side to the glamour that everybody associates with Dubai. The old adage ‘the early bird catches the worm’ isapt when visiting the markets as you can take some great shots of the traders setting up base for the day. Sticking with markets, the Dubai Spice Souk offers photographers another great opportunity to take some memorable shots. The Dubai Spice Souk is a traditional market that is also based in Deira and sells a range of foods, jewellery and other goods.Photographers should keep an eye out for locals and holidaymakers bartering with traders for their goods. There really are some awesome photographs to be had at the markets. Check out some of my other photography articles such as the best photography spots in Riga and a night of photography in Banff National Park. Just watch out if you stray away from the major tourist spots in Dubai. The Marina seems ok to take photos but just over the road in Jumeirah Lakes Towers I’ve had many a conversation with security guards about taking photos of the towers and lakes there. Apparently it’s fine for people with smartphones to take photos all day long. But head out with a DSLR and a tripod and you’ll have a security guard on a Segway telling you off before you know it. It’s illogical that you can create a digital image with one form of camera but not another but it’s Dubai, rules are rules and appear and disappear at the whims of individuals. That can happen in many other cities as well. I had that a lot in London, for instance at the office buildings near Tower Bridge or opposite Big Ben close to the London Eye. Same scenario as you described above!